I am a Genius! I knew it all along and of course, I can prove it. 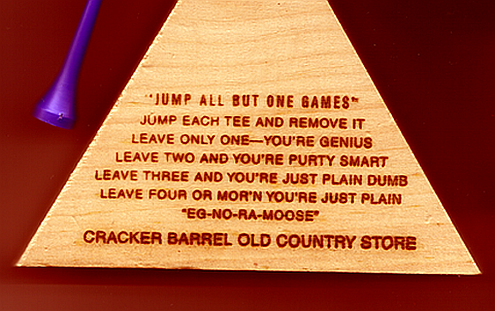 When visiting the Cracker Barrel restaurant, you will find a 15-peg triangle board game on each table. Every time we travel my wife insist on stopping at a Cracker Barrel restaurant and we spend most of our time trying to see who can solve that odd triangle shaped board game. Usually we never seem to reach the genius status but we do get the three or two peg mark, which isn’t bad but secretly we all want to hit genius level. (Except for the few times we get the three or four dunce mark – honest it was a mistake. I need a do over!). To be honest the game is kind of find to play as you wait for your meal to be served. We usually all take turns and laugh when one of us ends up failing to hit the mark after bragging how smart we are (I know I’ll get it this time). Like my wife who declared she could do better than me and utterly failed (I know I laughed – oh not at her, with her….). Like I said, I love a challenge and I enjoyed solving this one. I can’t wait to sit down with the family and prove once and for all – I am a Genius! Of course it seems that depending on how you set up the pegs you have to change the strategy, but I will figure that out soon. For any of you who may want to learn more about the game or would like a step by step “how to solve” Triangle Peg Board Game – I found this link to a guy who does just that. The instructions are a bit hard to follow (at least for me) but maybe it will work for you. Personally, I enjoyed trying to solve this on my own – nothing like the feeling of overcoming an obstacle.